After a long winter and a chilly spring, it's finally warming up. That means it's time for wonderful flowers to cut. Right now gardens in North Carolina are full of peonies, and hydrangeas--my favorite!--are just about ready to cut. 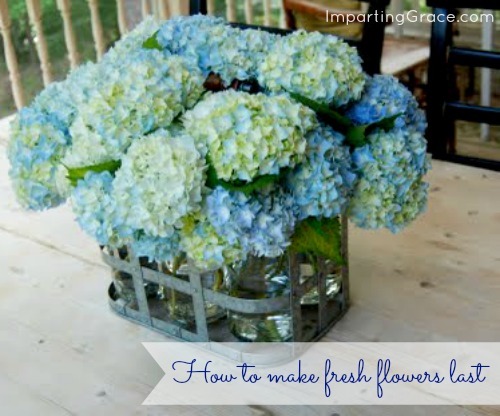 So I thought I'd pass along this simple tip for making fresh-cut flowers last longer. It couldn't be simpler: Place your flowers in water as soon as possible after cutting. Cut or strip away greenery that would lie below the water line. Then when you fill your vase with water, add a few drops of household bleach (such as Clorox) to the water. That's it! The small amount of bleach does no harm to the flowers, and it keeps the water clear. Flowers last much longer in clear water. See the flowers in the photo above? That picture was taken 12 days after I picked the hydrangeas. As you can see, there's a bit of yellowing on some of the leaves, but the flowers are still going strong! Bonus tip: if one of your hydrangeas does start to wilt, remove it from the vase, make a fresh cut at the base of the stem, and soak the entire flower (not just the stem) in a sink or bowl of water for about 45 minutes. The petals themselves will absorb some of the water, perking them right back up. Do you grow flowers? What's your favorite flower to cut and bring inside? Hi Richella, Thanks for this tip; I once heard adding 7-up did the trick too but that could draw ants, which I'm battling now. I love roses and my sweet man loves fresh flowers so often buys them at the market. Now I know the tip to keep them fresh. Amo hortências, são realmente lindas!! Thanks for the tip... I cut my roses and put them on the nightstand by my bed. I will have to give this a try. Hydrangeas are some of my favorite to bring inside and even to dry along with our lavender. I also enjoy cut dahlias at the end of summer. boots, many surplus treats will be offered. local sellers. And reproductions could possibly appearance just like terrific.